Estimación bayesiana aplicada a robótica y teoría de multirobots. Conocer los métodos elementales de estimación bayesiana aplicada a robótica. Conocer y saber aplicar técnicas de exploración y mapeado multirobot. Thrun, Burgard, Fox. Probabilistic Robotics. MIT Press, 2005. Cap. 1,2,3. Papoulis, Pillai. Probability, Random Variables and Stochastic Process. McGraw-Hill, 2002. Cap. 4,5,6. Alessandro Farinelli, Luca Iocchi, Daniele Nardi. 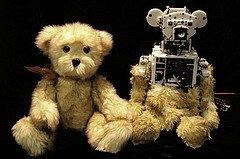 Multirobot Systems: A Classification Focused on Coordination. IEEE Transactions on Systems, Man, and Cybernetics, Oct 2004. Jakob Fredslund, Maja J Mataric. A General Algorithm for Robot Formations Using Local Sensing and Minimal Communication. In IEEE Transactions on Robotics and Automation, Special Issue on Multi Robot Systems, 18(5):837-846, October 2002. W. Burgard, M. Moors, C. Stachniss, F. Schneider. Coordinated Multi-Robot Exploration. IEEE Transactions on Robotics 21(3), 2005. Andreas Kolling, Stefano Carpin. Multirobot Cooperation for Surveillance of Multiple Moving Targets ? A New Behavioral Approach. IEEE International Conference on Robotics and Automation, 2006.